Make Your Celebration Special! Birthdays, graduations, holidays – any celebration deserves a gorgeous, delicious masterpiece from Cakes by Kim. Everyone will love these freshly-baked cakes, expertly designed specifically for your event. Let us design a cake based on your ideas, or ask for our suggestions. We take pride in our designs, so be confident that your cake will be an edible work of art everyone will enjoy. For The Holidays … Choose from many religious and popular holiday images for special occasions such as New Years, Valentine’s Day, St. Patrick’s Day, Easter, July 4th and others. Be Creative … Wedding pictures are great to help celebrate an anniversary. 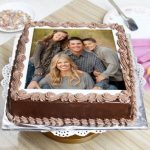 Our Photo Cakes are also a great way to celebrate a winning team, newborn baby, graduate, a birthday boy or girl, or a guest of honor at your gathering.